Can be personalized to fit any holiday occasion - Christmas, valentine's day, wedding, birthday, anniversary, engagement ... These items make great personal gifts for wife, husband, boyfriend, girlfriend and couple. 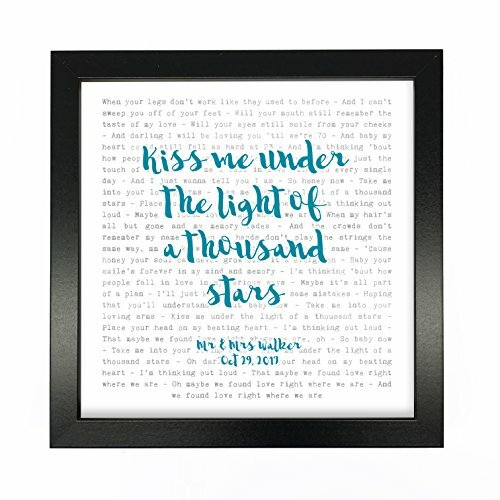 Lyrics picture is 23 x 23 cm in a deep edged freestanding square box frame with a Perspex front for safer transport. To personalized your item ... AFTER purchasing please send an email to sales@notjustaprint.com stating your order reference number AND 1) the color of the main text from our palette (or choose own) 2) the personalization you would like added at the bottom if any. Please double check the details sent as mistakes will incur a nominal re-print fee of £4.00 if not sent correctly. ** PLEASE NOTE ** we do not send drafts unless you specify that you wish to see one. If you wish to see a draft, please state this in order - it will be sent within 1 working day and must be approved ASAP - this may cause a delay to your expected dispatch time. If no details are sent to us afterwards you will automatically be sent a plain item in TEAL and a BLACK frame.